Want to stir up a hornet's nest? Just bring up warranty expiry and pre-expiry inspections in an article - you can find my take on the subject for the AutoTrader here. The automaker includes what it anticipates will be the average cost of repairs and corrections fleet-wide when it sets the price for that model; you paid for the warranty when you bought the vehicle. It's there to protect you from incurring expenses relating to defects or build issues with the vehicle for its duration. Use it, and don't feel guilty for doing so. Your end of the bargain is to do the required maintenance to keep that warranty valid. Maintenance doesn't necessarily have to be done by a dealership (accredited auto repair facilities can do it, for instance), however you must follow or exceed the manufacturer's guidelines, and you must document everything. Period. A single missed or unproven service could void the warranty on a related warranty repair. Unresolved complaint on a warranty item? Get documentation that you tried to address it and the service department couldn't replicate/diagnose/repair it before leaving. Always. Multiple attempts at repairing a serious issue could (in rare but not unheard-of cases) justify buy-back of the vehicle - note that there are no specific "lemon laws" in Ontario and many other jurisdictions, although Ontario's OMVIC and other similar groups may exist to help consumers. At a minimum, thorough documentation may be grounds for the manufacturer to step up to cover a just-out-of-warranty failure that has a history of unresolved complaints related to it. Unfortunately, there's also incentive for both dealerships and their technicians to overlook or dismiss warranty repairs. Most people, technicians included, are honest, but the system is structured to work against dealer technicians on warranty work. Having a trusted service facility do an appropriate inspection (general mechanical state of health, diagnostic code check, etc.) 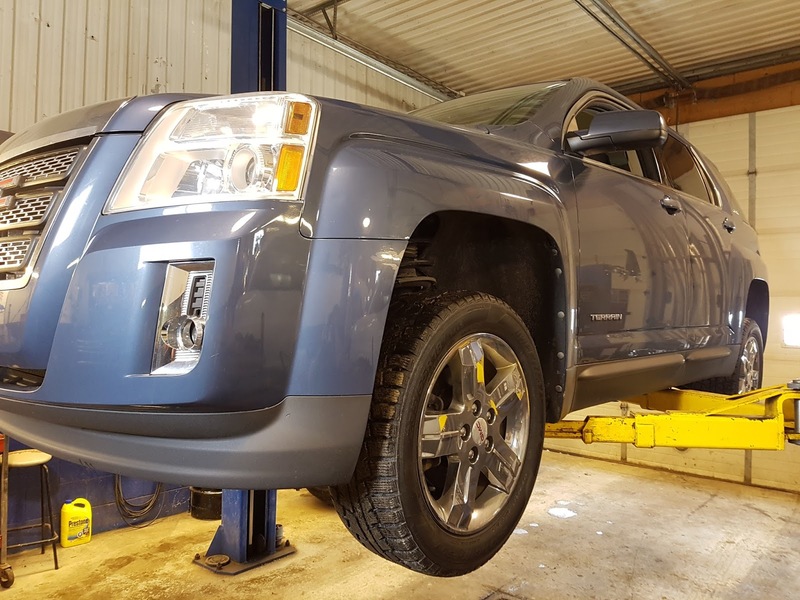 prior to the expiry of the warranty may catch things that might get overlooked, accidentally or otherwise, by the dealership's service department if asked to perform the same inspection. Depending on your relationship with the independent facility, such an inspection may cost an hour or less shop time, which could be money well spent. 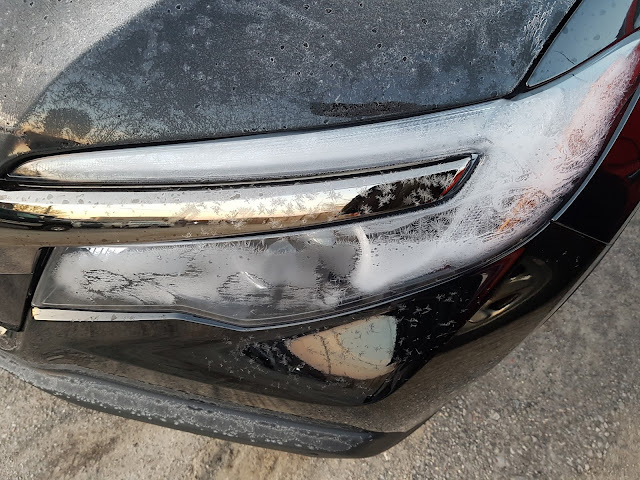 2017 Honda Ridgeline - LED headlights don't melt frost or snow. New vehicles come with an impressive array of tech and convenience features, some of which may have unexpected benefits or even drawbacks. You can read my thoughts on some of these items in my AutoTrader article here. One such drawback belongs to LED lighting, as exemplified by the low-beam headlights of Honda Ridgeline pictured above. This vehicle made the 15-plus minute commute to my workplace with the headlights on and still had the healthy layer of frost you see, even directly over the output area of the projector-beam lamp itself. As it turns out, part of the efficiency of LED's is a greatly reduced amount of waste heat production relative to even Xenon HID lamps, let alone conventional incandescent bulbs. Some aftermarket LED replacements for sealed-beam style bulbs are actually offered with optional heated lenses, a useful feature as they're often used in transport trucks and emergency equipment. I'm not aware of any original equipment headlights that include that function.